Then the LORD answered Job out of the whirlwind: “Or who shut in the sea with doors, when it burst forth from the womb; when I made clouds its garment, and thick darkness its swaddling band, and prescribed bounds for it, and set bars and doors, and said, `Thus far shall you come, and no farther, and here shall your proud waves be stayed’? Some went down to the sea in ships, doing business on the great waters; they saw the deeds of the LORD, his wondrous works in the deep. For he commanded, and raised the stormy wind, which lifted up the waves of the sea. They mounted up to heaven, they went down to the depths; their courage melted away in their evil plight; Then they cried to the LORD in their trouble, and he delivered them from their distress; he made the storm be still, and the waves of the sea were hushed. Then they were glad because they had quiet, and he brought them to their desired haven. Let them thank the LORD for his steadfast love, for his wonderful works to the sons of men! For the love of Christ controls us, because we are convinced that one has died for all; therefore all have died. And he died for all, that those who live might live no longer for themselves but for him who for their sake died and was raised. From now on, therefore, we regard no one from a human point of view; even though we once regarded Christ from a human point of view, we regard him thus no longer. Therefore, if any one is in Christ, he is a new creation; the old has passed away, behold, the new has come. I heard the blood rush in my ears. I felt the flush in my cheeks. My heart quickened until it was beating out of my chest. My fists clenched and my chest tightened. The waves of anxiety crashed all around me until I felt as if I would be swallowed alive. I was drowning. In that moment, I knew that I had two options. I could spiral down into the depths of the raging waters of my soul until I was numb to the pain and swallowed by sadness. Or, I could reach out my hand and cry to the Lord and have faith that I will not perish in His arms. When I put it into words, the simplicity of it is apparent. Rely on Him who saves us all from the raging waters. But in the grips of the strongest tide, the most violent storm, the swirling vortex of disquiet, my crippling fear causes me to grab at my throat and allow the pull of woe to send me into darkness. How is it that in my moments of immobilizing anxiety, I do not reach out to my steadfast Lord? When I know He is the only one to deliver me from the raging waters, why do I turn inward and allow the crushing anxiety pull me under? When my anxiety comes, I feel as if I have been capsized at sea. And I know the sea demands for me to be pulled under the crashing waves. But the sea of anxiety will not be silenced without Him. 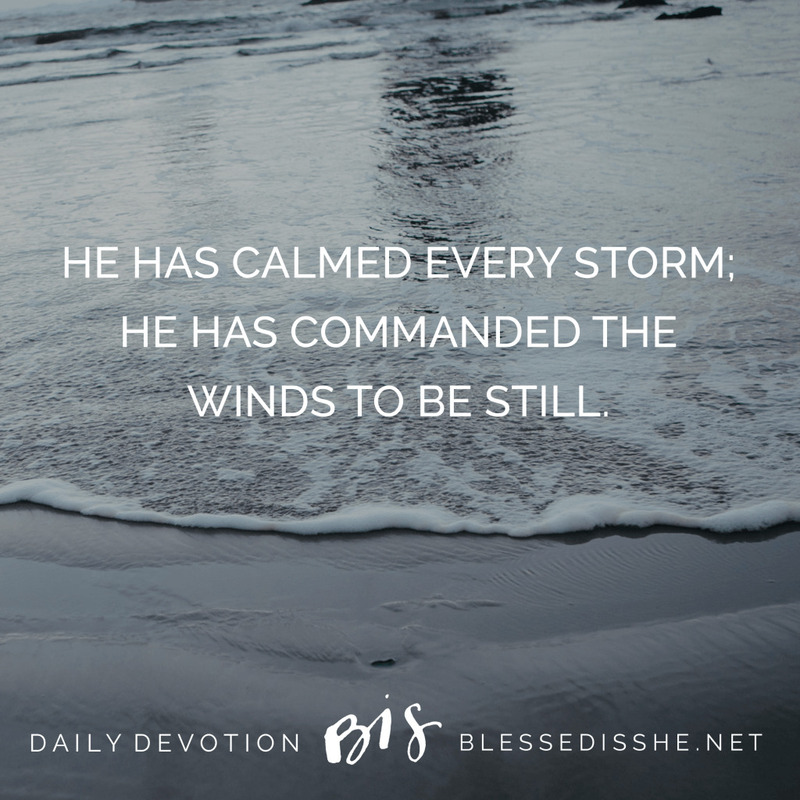 He has calmed every storm; He has commanded the winds to be still. He will pull me out of the crushing and raging waters as long as I reach out for Him. In those times of crushing anxiety, when my chest is full to burst, I must remember to offer it up to Him and allow him to calm the sea inside my soul. I will hear His voice in my ears. I will feel His hands on my cheeks. My heart will quicken in His presence. I will clench His hands in mine. The sea of anxiety will not be silenced without Him. If today you feel the crashing waves of anxiety in your heart, rebuke them in His name, and call out for Him. He will come to you.